Seldom have I received a promo that was accompanied by a press release as effective as the one under my nose. Sure, overhyping in a press release is the norm, most commonly taking the form of asinine methods like namedropping the “bigger name-band” production credits of the producer who has worked on the album at hand. But when the first superlatives raving about the true resurgence of old school thrash metal, searing leads, brutal riffage, etc. come undersigned by the likes of Mille Petrozza and Andreas Kisser, I get interested. 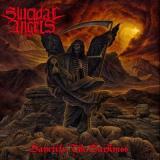 Such is the case with Suicidal Angels, apparently one of Greece’s latest gifts to the world of extreme metal. Formed in 2001, they put out smaller releases in their formative years until releasing their debut full-length in 2007 on a small American label. Recently they won some hullabaloo band contest over 1000 other groups that landed them a record deal with Nuclear Blast. With these credentials, late 2009 sees the release of their second studio album, Sanctify The Darkness. First off I gotta say that while metal has never been the most Jesus-friendly music, this record has got to be one the most anti-religion records I’ve ever heard that hasn’t been straight up black/death metal. I guess the title should’ve tipped me off, huh? Just listening through this CD makes me feel that the catholic church has got one major stranglehold on Greece, or at least one strong enough to make these four guys really pissed off. From The Pestilence Of Saints to Child Molester, every tune is just pure hostility. I know many feel this is self-evident, par for the course, nothing surprising, but to me the relentlessness in the songs is quite notable, even within the standards of metal. The songs themselves are very much what you’d expect: early days Sepultura/Slayer-style riffs at mostly breakneck speeds with plenty of pit incentives and the occasional jabbing moments for pumping your fists. The solos are fast and furious without too much emphasis on melody and the drum work keeps things relatively simple while pounding your face in. Singer Nick has that gruff Max Cavalera-tone down pretty well as he sounds fierce throughout, even though he doesn’t really let loose at any point with the kind of throat-destroying screams of murder so typical to older thrash. I would’ve actually liked some of those Petrozza-style shrieks, but the singing is good enough as it is. Analyzing the songs separately would be pretty redundant as most of this is just rapid mosh material through and through. It’s telling that the one song where they start with a little more mid-tempo approach, Atheist, is by far the most mediocre tune here. The little-under-2-minute instrumental, Mourning Of The Cursed, is also left feeling like major filler as it just ends right when it feels it’s getting somewhere. The production is really good throughout, not too polished and leaving a sense of rawness while keeping everything punchy and balanced. If you’re thinking what would separate Suicidal Angels from bands like Municipal Waste that have taken the recent old school thrash revival into the crossover territory, I’d say the main difference is in attitude and overall vibe in the music. With MW, you feel that there’s a tongue hitting a cheek every so often. On Sanctify The Darkness, the only place I can imagine tongues being is on the ground, all bloody after they were bit off in the middle of a seriously evil grimace. While this album is nothing original and could have slightly better hooks here and there, everyone craving for old Kreator-type thrash metal should fall in love with it real damn fast. For myself and for a band that I had never heard of before, definitely SOTM-material!